Surveys of collection backlogs are common place in the archival profession. Many repositories undertake them, using various methodologies and with varying results. I’m presently in the midst of such a backlog survey for the Archives Center’s invention and technology-related collections. I’m using the Archivists Toolkit assessment tool for the survey. It allows for a combination of qualitative and quantitative measures to assess collections. Each collection is rated on a 1-5 (5 being the highest) numerical scale for physical condition, quality of housing, physical access, and intellectual access. One of the great joys of surveying is being able to open each box, file drawer, or map case drawer and discovering something previously unknown. I recently surveyed the Worthington Pump and Machinery Corporation Records, which document the company’s work in manufacturing steam pumps, pumping engines, condensers, and hydraulic machinery. Henry R. Worthington (1817-1880), inventor, hydraulic engineer, and pre-eminent authority in the design and construction of pumping engines, founded the Worthington Pump Works in the mid-1840s. Worthington made significant contributions to the development of the direct and duplex steam pumps (US 13,370) in 1855. His duplex steam pump patent model (US 116,131) is also housed at the National Museum of American History. Pumps, engines, and condensers are not usually considered exciting, but I was “pumped” to find four drafting notebooks from 1882-1898, belonging to engineers Charles Campbell Worthington (1854-1944) and William A.P. Bicknell. Charles, known as “C.C.,” was the son of Henry R. Worthington. He graduated from Columbia University with a degree in engineering and assumed leadership of the company in 1880 upon his father’s death. While at Worthington Pump and Machinery Corporation, C.C. contributed many new ideas to the company’s product line receiving patents for draining steam jackets, valve movements for pumps, direct acting engines, and condensing apparatus. Bicknell contributed heavily to the drafting notebooks that were clearly a shared endeavor. Like C.C., Bicknell held several patents for valves and air compressors. The bound drafting books contain “new ideas” for air compressors, regulators, valve gears, water meters, and oscillators, to name a few. Drawn in pencil and ink, the sketches were created by trained engineers. 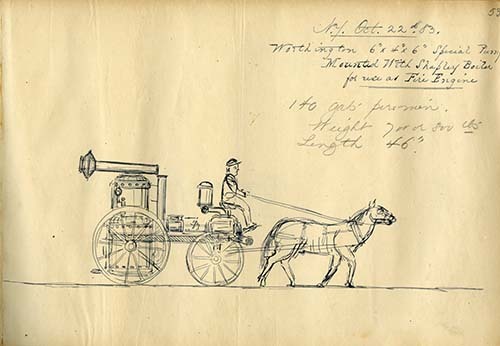 Both Worthington and Bicknell demonstrated a capable hand at drafting and sketching. 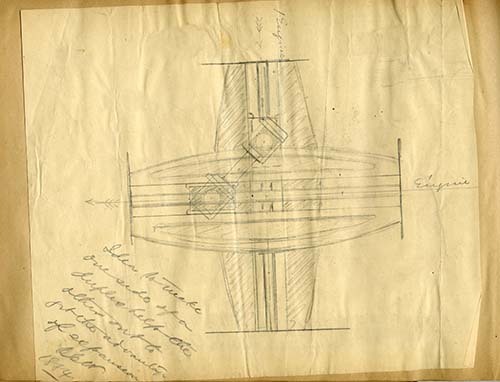 Many of the sketches include a date, explanatory text, and are signed by the draftsman and a witness. A witness was used to establish priority for and the progress of an invention. This was especially important if there were any future issues, particularly legal problems surrounding a patent and the manufacturing process. In most instances, Bicknell witnessed Worthington’s drawings and vice versa. 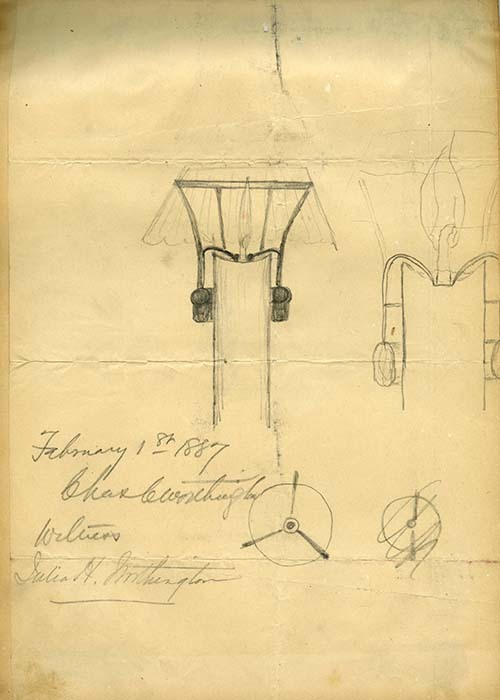 Even C.C’s daughter, Julia, witnessed a pencil sketch for a lamp on February 1, 1887. Some of the familiar attributes and properties of sketching are present in the notebooks: unpolished, quick, direct, clear, accidental, without details, open ended, and plentiful. The examples here illustrate this. 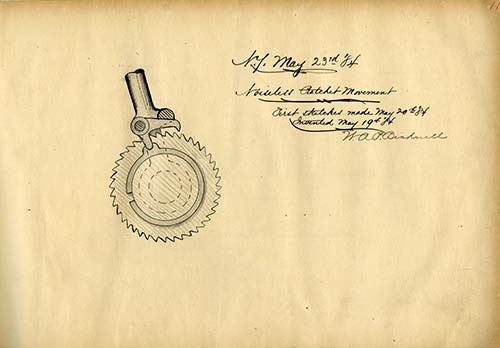 Bicknell’s “noiseless ratchet” is polished and concise, communicating quickly the idea which was witnessed. Worthington’s “duplex engine” demonstrates a quickness of hand, is less polished and is not witnessed. In 1899, C. C. sold his interests in the Worthington Corporation to the leading pump companies in the US, which were incorporated under the name International Steam Pump Company. In 1900, he created the Worthington Automobile Company (1904-1905) to market the Meteor steam automobile. Later, he created Worthington Mower Company which produced a light-weight duty tractor. The motor gang lawn mower, known as the “Shawnee Mower” in 1917 (US 1,210,879) took its name from the golf course Worthington created circa 1903. The mower could cut a width of over seven feet. An avid golfer, Worthington contributed to the design and creation of the Caldeno Golf Course in the Delaware Water Gap, Pennsylvania (1887) as well as a golf bag (US 1,563, 816) in 1925, and numerous other improvements to his lawn mower. How many of Worthington and Bicknell’s sketches became products I do not know, but they are worthy of a look and I have the survey to thank for that. To learn more about pumps, valves, condensers, and engines and their place in the history of technology, visit the Archives Center. Farmer and Mechanic, Volume 1, No. 1, January 1, 1847. Summa, Marie, Frank Summa and Arthur Garris. Eastern Poconos: Delaware Water Gap to Bushkill. Charleston SC : Arcadia, 2005.